Clock/Timer Module can be installed into a SideBoard SB-8F +3 or the SBC-5 GP Vertical Turret. 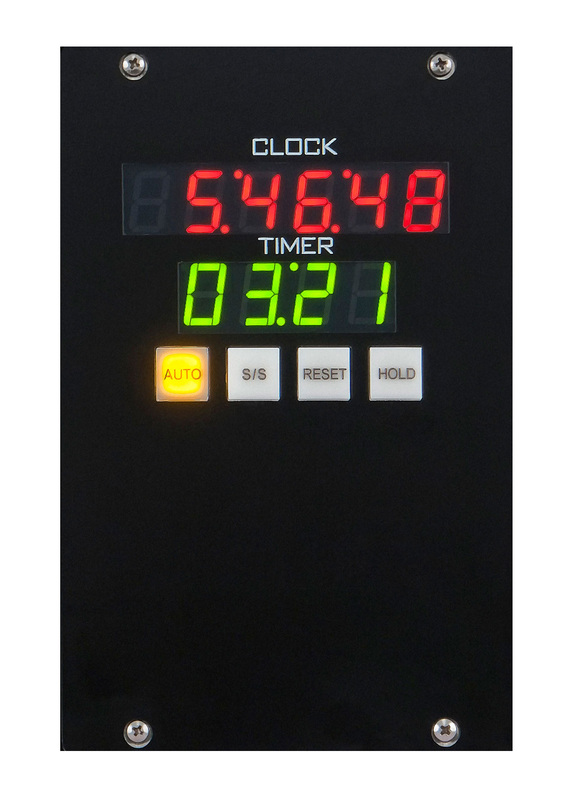 Clock can sync to ESE timecode. This brochure provides overviews of the entire WheatNet-IP Intelligent Network. It includes technical details as well as acts as a catalog for all Control Surfaces, BLADES and Accessories. Scott Fybush and Lance Venta document WBZ Boston's transition to new facilities. Part One looks at the new studios. Scott Fybush and Lance Venta document WBZ Boston's transition to new facilities. Part One looks at the old studios. The Miwuk Tribe take Rancheria Radio online with four streaming stations. WRAY makes the jump from analog to AoIP networking and digital transmission. Chris Wygal examines the world of AoIP networking. Henrik Poulsen discusses the possibilities when using ScreenBuilder. An overview of the modern AoIP studio workflow. Reprint of October 2016 article from Radio Magazine on Hubbard Broadcasting in Phoenix. This article by Tony Abfalter, reprinted from the July 1, 2015 issue of Radio World, describes how Leighton Broadcasting discovered that the days of running a large amount of wire through a facility are gone for good. In this reprint from the June, 2015 issue of Radio magazine, Marc Lehmuth and E.C. Hamilton look at the WheatNet-IP based installation of financial ttalk radio's Impact Partnership. In this reprint from the October, 2011 issue of Radio magazine, Shawn Smith interviews integrator Richard Sondermeyer about the complete studio rebuild of Canadian Magic 96.7 in Peterborough, Ontario. A look at sending audio over IP via packets, and network considerations such as latency and jitter. A Radio World Engineering Extra by Greg Massey and Jon McClintock. Reprinted by permission.